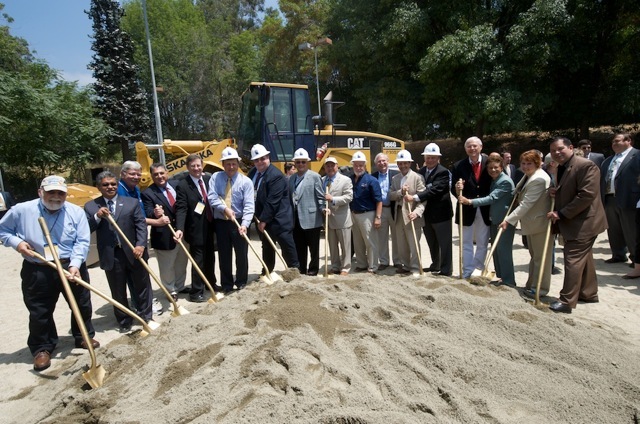 Many of the public officials on hand for Saturday's event take a turn behind the golden shovels. The tracks where the Gold Line will run are in back of the bulldozer. Photo by Gary Leonard. The quote in the headline — “this whole county is going to change” — is courtesy of Ara Najarian, the chairman of the Board of Directors of Metro and the mayor of Glendale. He was one of many public officials who spoke Saturday morning at the ceremonial groundbreaking of the Gold Line Foothill Extension in Arcadia, a project that has been on the drawing board for more than a decade and is about to become a reality. Ara Najarian, the Chairman of the Board of Directors of Metro, speaks at the ceremonial groundbreaking on Saturday. Photo by Gary Leonard. 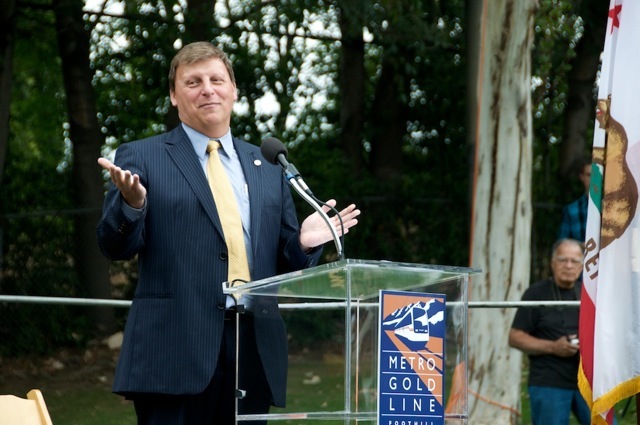 Najarian was one of more than a dozen public officials who spoke at the event and he was referring to the fact that the Foothill Extension will be the first rail project to get underway that is funded by Measure R sales tax increase approved by voters in 2008. Several other Measure R rail projects should also break ground in the next few years and when done, Los Angeles County will have a much improved network of light rail, subway and commuter rail — the change that Najarian was talking about. The Foothill Extension will take the current Gold Line from its terminus in Pasadena for 11.3 more miles to the Azusa/Glendora border. Officials with the Foothill Extension Construction Authority say that construction will begin later this year with work on the so-called “Iconic” bridge structure over the southbound lanes of the 210 freeway. Officials are projecting a 2014 opening. Many other public officials made similar promises to keep improving the area’s transit system. County Supervisor Mike Antonovich reminded the crowd that the second phase of the Foothill Extension — from Azusa to Montclair — remains a top priority for Metro for certain types of federal funding. “None of us will rest until this line goes to Ontario Airport,” said Rep. Adam Schiff, talking about a third phase of the extension that is under study. 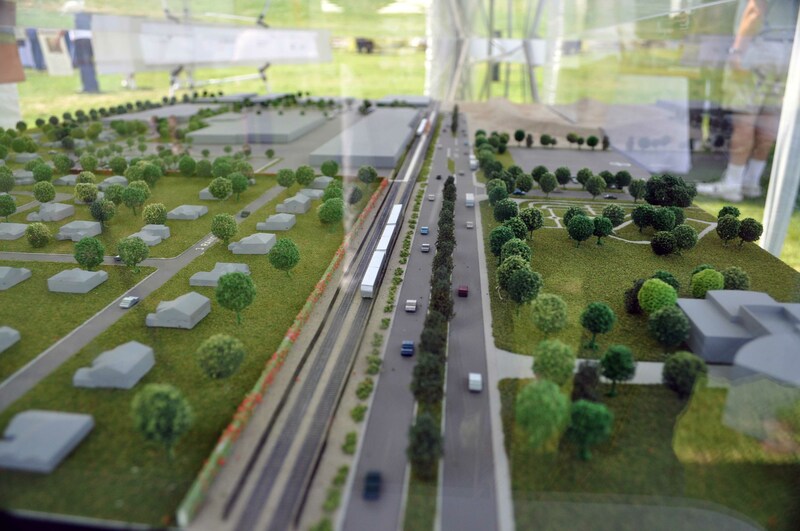 A model of the Foothill Extension zipping through Duarte. And Rep. Judy Chu said she would fight to secure funding for the 30/10 Initiative to build a slate of local transit projects in the next 10 years instead of the next three decades, as planned. Several speakers also credited Habib Balian, CEO of the Foothill Extension Construction Authority, for sticking with the project for many years as the planning unfolded and the wait for funding went on…and on…and on. Among other speakers and attendees were Rep. David Dreier, Rep. Grace Napolitano, Duarte Councilman and Metro Director John Fasana, Assemblyman Anthony Portantino, Assemblyman Ed Hernandez, State Senator Carol Liu, Azusa Councilman Keith Hanks and Los Angeles City Councilman Ed Reyes. Metro CEO Art Leahy was also acknowledged. To read more about the Foothill Extension, here’s a link to a recent Q&A on The Source that looks at several aspects of the project.